Continuing the theme of the Foster Census of cubic symmetric graphs (networks) from my last post, here is the graph F96B from that census (click on the picture for a larger image). 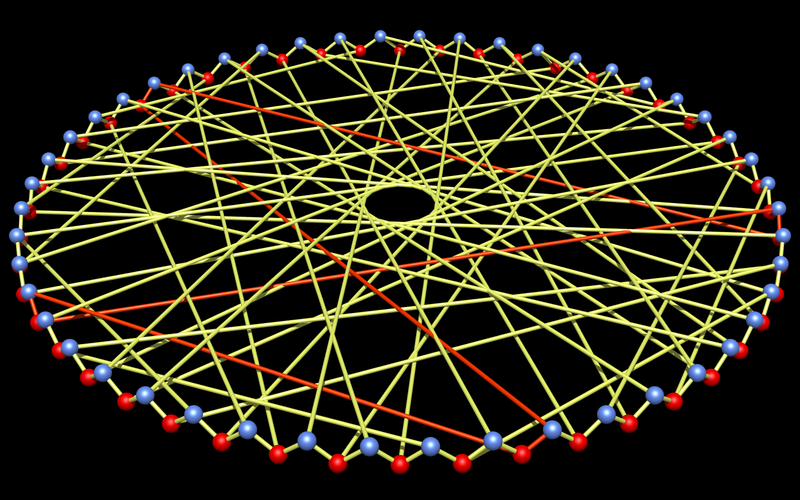 This beautifully symmetrical graph has 96 nodes (all equivalent) and 144 edges (also all equivalent). The image does not do justice to the symmetry of this graph. Graph F96B is bipartite: the two classes of node are coloured red and blue. It has diameter 7 and girth 8. One of the 8-rings within the graph is highlighted in orange. The graph can be expressed in LCF notation as [−45, −33, −15, 45, −39, −21, −45, 39, 21, 45, −15, 15, −45, 39, −39, 45, 33, 27, −45, 15, −27, 45, −39, 39]4. From the wonderful Information is Beautiful Awards website, here is an interesting visualisation of careers chosen by 15,600 alumni of Williams College (right half of circle), given their majors (left half of circle). There is some aggregation here – “Cultural Studies” includes Anthropology, Sociology, and Asian Studies, for example. The visualisation was produced by Satyan Devados, and an interactive collection of subset images is also available here. 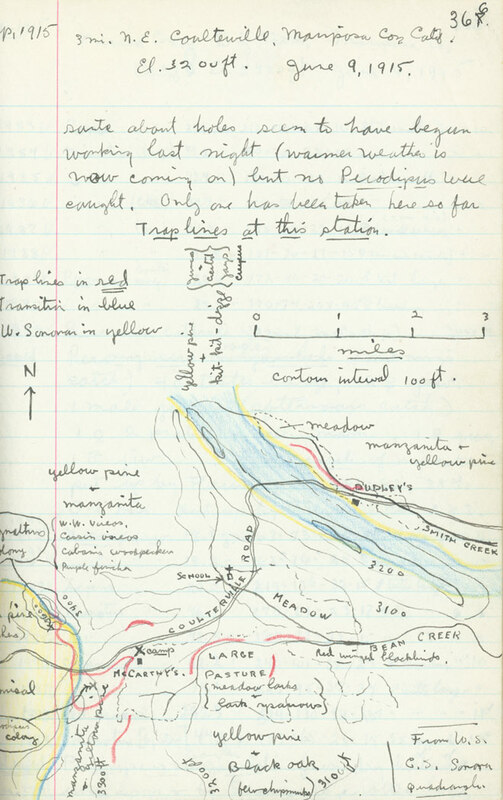 The so-called “Foster Census” of cubic symmetric graphs (networks) has been very ably continued by New Zealand mathematician Professor Marston Conder. 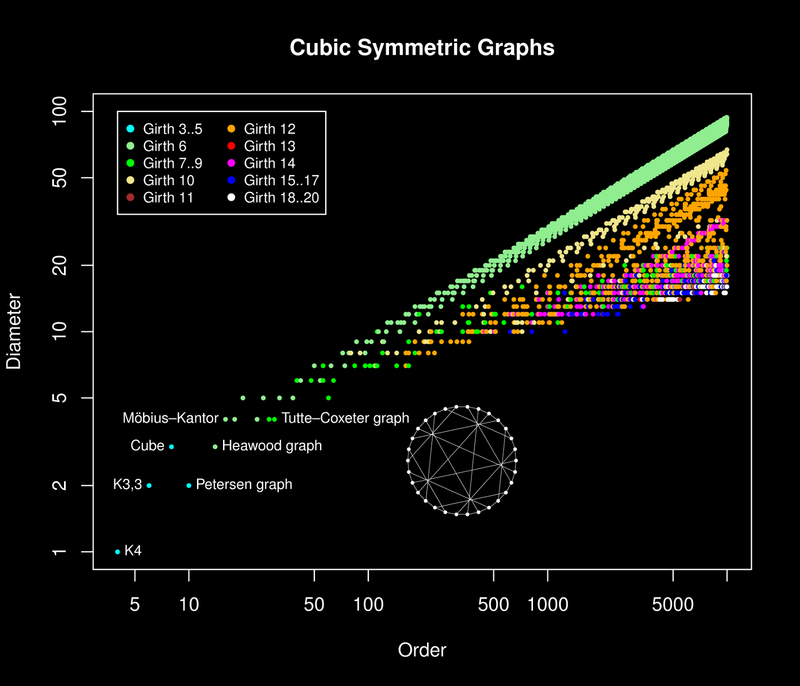 In August last year, he gave us a complete list of cubic symmetric graphs on up to 10,000 vertices. The chart above summarises that list, noting the diameter, girth, and order (number of vertices) of each graph. Each coloured dot is a graph. Seven of the better-known graphs are labelled, and the Tutte–Coxeter graph is illustrated (click on the chart for a larger image). The University of Auckland: it’s not just fantastic movies that come out of New Zealand! 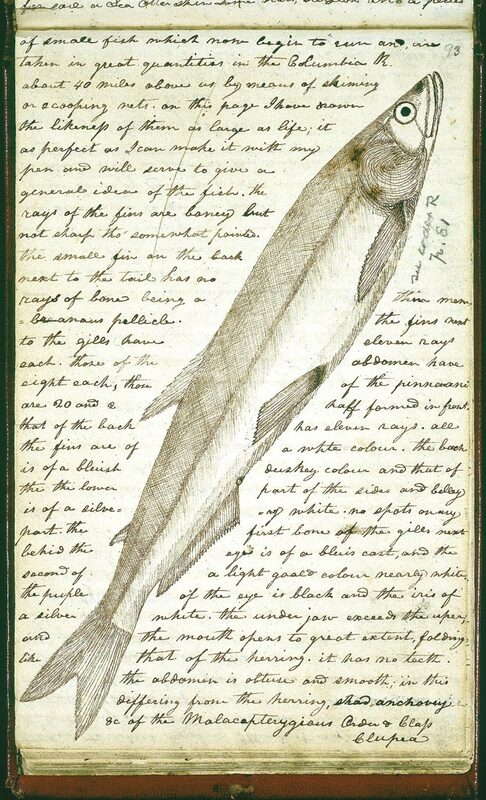 I fell in love with Field Notes on Science & Nature some time ago, when I saw the cover (and some other stunning pictures) in a Wired Science post. This wonderful book has certainly inspired me to take better notes. And to keep my eyes more open, because there’s a lot we still don’t know about the plants and animals around us. I highly recommend this book to anyone with an interest in doing or teaching science, and indeed to anyone interested in the natural world. This classic visualisation by Chris Harrison shows 63,779 cross references within the Bible as coloured arcs. The bar chart at the bottom shows the number of verses in each chapter (the lengthy 119th Psalm stands out visibly). Cross references are visible at several different scales. For example, a spray of yellow arcs terminating at the lower right marks the numerous Old-Testament references in the book of Hebrews. This diagram won an honourable mention in the 2008 International Science and Engineering Visualization Challenge. This X-ray image, from March 2012, was taken by NASA’s Solar Dynamics Observatory at a wavelength of 13.1 nm. The image, which shows sunspots and a medium-sized solar flare, has a cold beauty that belies the hellish high-energy reality being depicted. Ball does a very nice job of explaining why these (and similar) branching patterns exist, as well as providing a good discussion of network structures. A fun little book, which I heartily recommend.